Above: Summer Glau as the new model Terminator. "3 billion human lives ended on August 29th, 1997. The survivors of the nuclear fire called the war Judgment Day. They lived only to face a new nightmare: the war against the machines. The computer which controlled the machines, Skynet, sent two Terminators back through time. Their mission: to destroy the leader of the human resistance, John Connor, my son. The first Terminator was programmed to strike at me in the year 1984, before John was born. It failed. The second was set to strike at John himself when he was still a child. As before, the resistance was able to send a lone warrior, a protector for John. It was just a question of which one of them would reach him first," Sarah Connor (Linda Hamilton), narrating past and future events from her vantage point in 1991, in Terminator 2: Judgment Day (1991). This past week saw the airing of the first two episodes of "Terminator: The Sarah Connor Chronicles," a television reboot of the franchise which saw its first cinematic installment in 1984, its second in 1991, and its third in 2003. The title character and protagonist, Sarah Connor (Lena Headey), scowls her way through the first two episodes, all the while attempting to protect her son, John (Thomas Dekker), the purported future leader of an underground resistance movement. A new, younger model Terminator (Summer Glau, of "Firefly" and "The 4400" and apparently now doomed to second rate television science fiction) arrives to protect John Conner from the plethora of other Terminators pursuing various related and unrelated missions in the past. Predictably, there are inconsistencies between the new series and the films which came before, although they appear to arise mostly from the writers' laziness. In Terminator 3: Rise of the Machines, Sarah Connor is already dead, having succumbed to leukemia in 1997, after the events of Terminator 2, following a three year battle with the disease. She lived long enough to see the original 1997 "judgment day" pass without incident. Her ashes were spread at sea while a casket containing a cache of weapons was placed for John to find at a false grave site. The epitaph on her mausoleum niche reads: No fate but what we make. Thus, according to the official Terminator continuity, Sarah Connor dies of natural causes in 1997. In the new television series, this detail is overlooked and even ignored. The narrative begins in 1999 - two years after the supposed death of Sarah Connor - yet she still lives. I thought that The Sarah Connor Chronicles did a decent job of maintaining the overall feel and flow of the Terminator movies (the small handful of clunky, dumb lines on the show were delivered by Terminators, sadly, but that's also kind of in keeping with the movies), and I was glad to see that the producers didn't try to "lighten up" the mood of the overall Terminator storyline. 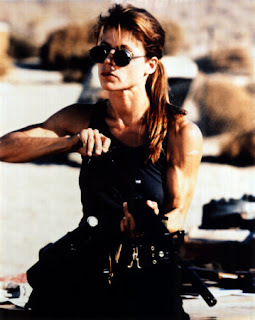 Some people will undoubtedly have problems with the casting of Summer Glau as a cute, young, female Terminator (I have my reservations about this as well), but the focus seems to be primarily upon Lena Headey as Sarah Connor, and I thought that she carried off the role of the paranoid warrior/mommy pretty well. In the original two Terminator films, Connor is played by Linda Hamilton, far more intense and intimidating than Headey has revealed herself to be playing the same character. As aforementioned, the character does not appeared in the third film. Hamilton is 17 years older than Headey, and it shows. In fact, Headey was born in 1973, making her 11 years old at the time of the events of the first film and 18 years old and the time of the second. Hamilton, however, was born in 1956, meaning she was in her late twenties at the time of the release of the first film and approximately 35 at the time of the second film. 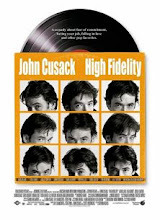 Although the actor playing a character need not be the same age as that character, Headey looks young enough to call into question the timeline of the entire franchise, all the more parlous when a film is about time. (There is some question about when Terminator 2 takes place, in 1991, the year of its release, or sometime later in the mid-1990s, as John Connor, born in 1984 or 1985 as per the events of the first film, is ten years old at the time of Terminator 2: Judgment Day.). Above: Kyle Reese (Michael Biehn) and Sarah Connor (Linda Hamiltion) in 1984's The Terminator. Above: Sarah Connor (Linda Hamilton) in 1991's Terminator 2: Judgment Day. 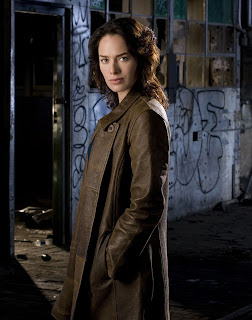 Above: Sarah Connor (Lena Headey) in 2008's "Terminator: The Sarah Connor Chronicles" (which is actually set in 1999 at first, then 2007 after a leap forward in time). T2 takes place in 1995 according to the police car computer T1000 uses in his first scene.